It's Memorial Day weekend and everyone has a barbecue to go to and everyone needs to "bring a dish." Not many people have time to spend an hour or two in the kitchen preparing one though. That's why this 15 minute dish is perfect! It requires 2 pounds of cooked shrimp, but this time of year you can get a frozen bag on sale for about $8 at your local grocery store. This is my version of Mexican shrimp cocktail. It is so good and so easy. Leave it to sit in the fridge overnight or for at least 4 hours. Everyone will be asking for this recipe. Be sure to bring some bowls so guests can ladle themselves a serving! 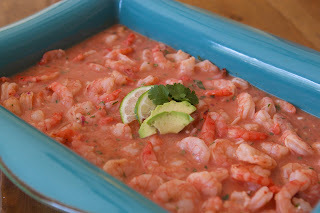 Defrost shrimp in cold water for about 10 minutes, drain and dry thoroughly or the dish will be too soupy. Place all ingredients (except avocado) in a 9 X 13 dish and stir together. Add shrimp to dish and stir to combine, cover and refrigerate overnight or for 3-4 hours. Before serving, fold in avocado. Copyright © PrepAhead and Dine In: mexican shrimp cocktail. All Rights Reserved.